A family has just claimed the huge $50 million Powerball jackpot in Western Australia. This represents the biggest single Division 1 prize in the state’s history. The winners purchased their lucky entry at the newsXpress outlet at Armadale Central Shopping Center, owned by Philip Lu. The family, who have not revealed their identities, say they plan to go on living as the same down-to-earth people. However, this time they will be able to pay off debts, get their home renovated, help family, and donate to charity. 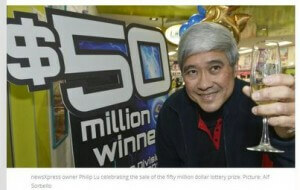 THE lucky winner of WA’s enormous $50 million Powerball jackpot has come forward to claim their record-breaking prize.